Award Title: AAPE Diamond Award. To be awarded to adult AAPE Members only. This award is to honor the exhibitor and not the exhibit. Award Criteria: Granted to a multiple frame exhibit that has been awarded 10 Gold medals at a U.S. or Canadian National level show while the property of one exhibitor, or to an exhibitor who has won Gold medals with six or more multi-frame exhibits of their own creation at the National level. Any exhibit developed from an original concept through a logical evolution of content as well as size will be considered a single exhibit. 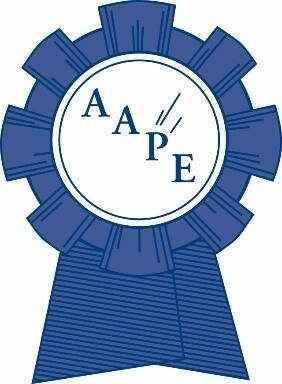 AAPE membership is a requirement for consideration at the time of receiving the AAPE Diamond Award. The Object: Is to recognize sustained excellence, to encourage higher frequency of exhibiting at WSP shows, and to provide another means by which AAPE can be newsworthy and recognize excellence and accomplishment. Time Limitation: The period for qualification shall begin with the year 10 years prior to the current year of award request. The time periods shall be adjusted as necessary by the AAPE BOD to move forward in time. The Form of the award: The award shall be a distinctive diamond-shaped lapel pin presented with a suitable box. Although there are two separate criteria for qualification, there shall be only a single designed award. A suitably designed certificate recognizing the recipient and the distinction awarded shall be given.